In a certain sense, retired politicians have it easy. If they’ve found a way to keep a relatively clear conscience, they have the benefit of tremendous insider experience—and all the ironclad authority that comes with it—and little actual responsibility. They can say what they want about what should be done, and make it sound real good, and all we can say is, Well, why didn’t you do that when you could have? But good-enough excuses always seem to be on hand. Easy-peasy. a new definition of “defense” that takes into account the quality of our education, the health of our people, the preservation of the environment, the strength of our transportation, the development of alternative fuels, the vigor of our democracy. These were the concerns expressed by the people who stood in Cairo’s Tahrir Square holding up their signs for more than two weeks this winter. Without guns, knives, or the use of their fists, they brought down the dictator who had exploited them for nearly thirty years. He goes on to recommend the immediate withdrawal of troops from Afghanistan, the closure of US military bases in the Middle East (and probably in Europe and South Korea), a $500 billion cut in our $700 billion military expenditures, and taxation for the richest Americans (as Warren Buffett recently called for). Then he goes on to describe all that could be done with this money: high-speed rail, a new GI Bill, and the expansion of Medicare to all Americans. 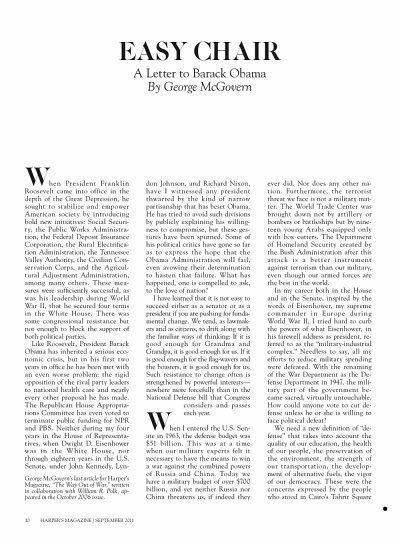 George McGoveern’s advice to President Obama is right on the mark. What if a million of us were to send copies of this letter to Obama? Lets let Obama know that Mc Govern’s proposala are what will make America safe and secure and put us back to work – and will get Obama reelected. Listen to George Mc Govern, not pursue the horrendous policies of George W Bush which are destroying our country (and Iraq and Afghanistan) and the soul of America. Indeed. On that note, see you on October 6th! Friends, during the Vietnam war, like my entire family, I voted for George McGovern. Ot was the first and the happiest vote of my life. If I could, I would vote for him again. I think it is essential that the U.S.A. quit pursuing foreign wars. and trucks might be removed from our overburdened interstate highways, at minimum expense. Small airports could be closed. And freight trains might also take advantage of the rail improvements. Places without railroad tracks could receive connectng bus service, as is already done in California and several other states.